Best option for condo flooring, tile or laminate? For replacing a floor in an old condo, what would be the best option? I like the look of laminate better to tiles, but it's not termite proof, right? For tiles, something plain like an off white looks decent. I guess tiles for longevety, unless there's a termite proof laminate option? Tiles will be nearly indestructible as long as you dont drop metal things onto them and chip them. Laminate will have a fairly short life by comparison, especially if you like to move furniture around, or if it gets damp. Wood effect tiles can be a very good compromise though quite expensive. I would probably use them if I was re-tiling my condo. Always buy a few tiles more than you need as they can be very handy if one gets chipped or cracked in the future. We installed the wood look tiles although darker than yours, and they still look great years later. You'll be replacing Laminate in years to come. Thanks. I've found 8cm thick laminate at 300 baht per sqm, what about decent wood look tiles, how much per sqm? Any photos? Laminate is popular in the west now because the installation costs are so much cheaper than tile and the modern materials used are actually quite good. In Thailand because labor is so cheap you should buy porcelain tiles if durability is a factor you're looking for. there are some thicker laminates that can survive a sand an reseal or two, but they will be harder to come by and will probably be out of your budget range of 300-600 baht m2. If you do choose a laminate, there are a few things you can check. Choose an underlay you like the feel of. 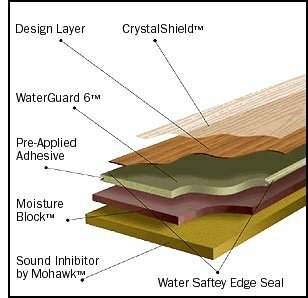 some underlays have good sound deadening but are 'squishy' under foot as the laminate board defects. You might like or dislike that. Make sure the laminate is installed properly. In tropics like this the laminate boards do expand. If you are 20 boards wide in a room and they all expand 2mm, you need to make sure you have the clearance for them to grow. If not, they will start to cup. This means you need to allow for a skirting system to hide the expansion gaps for where the laminate floor meets the walls. Make sure that is included in any quote. I've seen the cupping issue more than I would have expected to in both new and renovated homes and condos over here. You cannot sand and refinish laminate - real wood floor yes. Actually you can on some laminates. Thinner composite and vinyl laminates can't. True veneer laminates with a decent veneer surface can. It depends on the materials they are made from and their thickness. You need to seal the subfloor or the moisture will cause mold under the flooring or tiles. Choose the best quality imported ceramic tiles. Much more resistant. Bonthavon has a fine choice. The feeling of the foot on real tiles and laminate is not the same .. ... IMHO of course !